Greydon Turner has been elected by his peers to serve as Arkansas Tech University Student Government Association president for the 2019-20 academic year. Turner (photographed) will be a junior at ATU during the 2019-2020 academic year. He has previously served SGA as freshman senator, sophomore senator and secretary of community outreach. A native of Dallas, Texas, Turner is majoring in economics and finance as well as management in the ATU College of Business. He is vice president of Pi Kappa Alpha fraternity and will serve as an orientation leader at ATU in 2019-20. Joining Turner on the SGA Executive Board in 2019-20 will be Noah Tidmore of Prairie Grove, vice president; Bailey Fowler of Farmington, secretary of finance and administration; Charleigh Kennamore of Russellville, secretary of internal affairs; Abi Sasore of Dunleer, Ireland, secretary of diversity and inclusion; Jacob Loomis of Bryant, secretary of student development; and Zoe Stokes of Dardanelle, secretary of public relations. 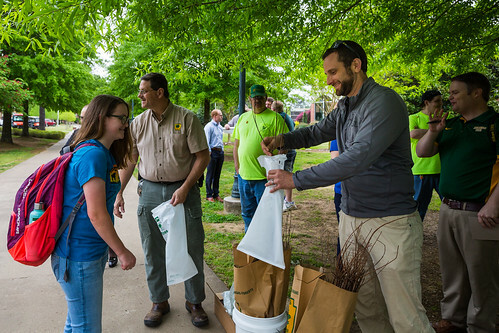 Arkansas Tech University planted a sassafras tree on the south side of McEver Hall during its 2019 Arbor Day observance on Wednesday, April 17. 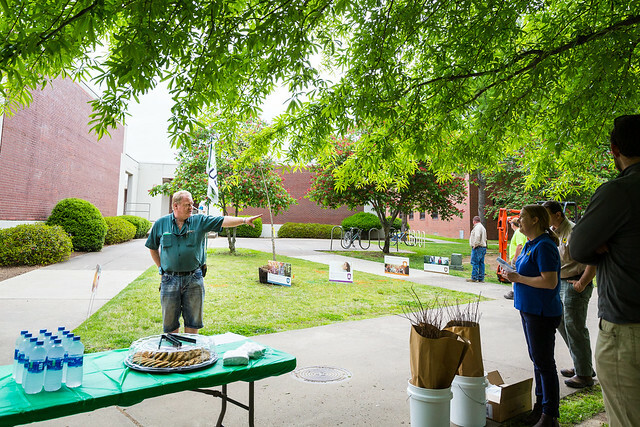 The annual Arbor Day event is part of ATU’s status as a Tree Campus USA. Arkansas Tech earned that designation in 2016 and has maintained it ever since. ATU began a tree planting program during the 2009-10 academic year. The trees are a continuation of a long-term landscaping beautification program made possible through the generosity of Tech alumni Robert and Sandra Norman of Tulsa, Okla.
As of spring 2019, the Norman family tree project has led to the planting and care of 1,200 trees on the Arkansas Tech campus in Russellville. 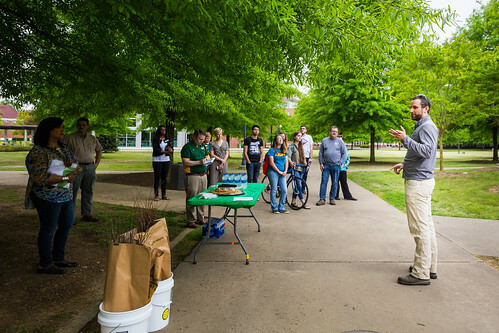 Krista Quinn, urban forestry program coordinator for the Arkansas Forestry Commission, spoke during the April 17 ceremony at ATU. Quinn pointed to Arkansas Tech’s program as an important contribution to maintaining trees in populated areas. She shared that while the overall tree population in the United States has increased over the past 50 years, U.S. urban areas are losing an average of 36 million trees per year. 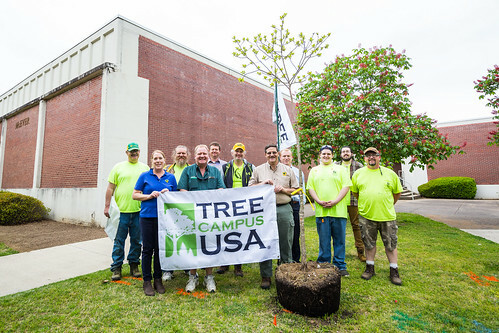 Three institutions in Arkansas hold the Tree Campus USA designation from the Arbor Day Foundation. In addition to ATU, the others are the University of Arkansas at Monticello and the University of Arkansas for Medical Sciences. 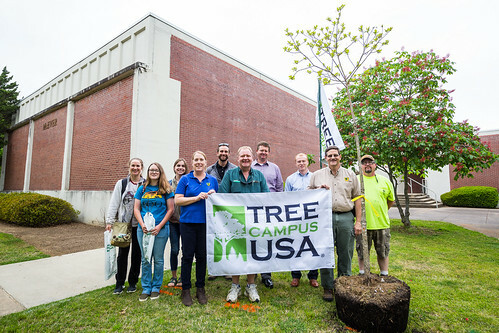 Learn more about the Tree Campus USA program. Faculty, staff and students from Arkansas Tech University welcomed guests from the Arkansas Department of Education at the Doc Bryan Student Services Center Rotunda on Thursday, April 18, and participated in a statewide initiative recognizing the contributions of education professionals. The inaugural Arkansas Educator Commitment Signing Week, which took place April 14-20, 2019, was “dedicated to promoting and celebrating those who have committed to the teaching profession” according to information provided by the sponsoring organization, the Arkansas Department of Education. More than 250 new, veteran, and future teachers at the ATU event signed a “Commitment to Education,” showing their personal pledge to the students of Arkansas, the teaching profession and the future of education in the state. The ceremony was organized by the ATU College of Education. Dr. Robin E. Bowen, ATU president, shared with the ATU education students in attendance a story about Bill Gates’ elementary school librarian, Blanche Caffiere, and how she changed his life forever by encouraging his love of reading. Photographed, top of page (from left-to-right): Dr. Linda Bean, dean of the ATU College of Education; Dr. Robin E. Bowen, ATU president; Dr. Ivy Pfeffer, Arkansas Department of Education deputy commissioner of human resources, educator effectiveness and licensure; Dr. Phillip Bridgmon, interim vice president for academic affairs at ATU; and Jeff Dyer, Arkansas Department of Education teacher recruitment and retention program advisor. 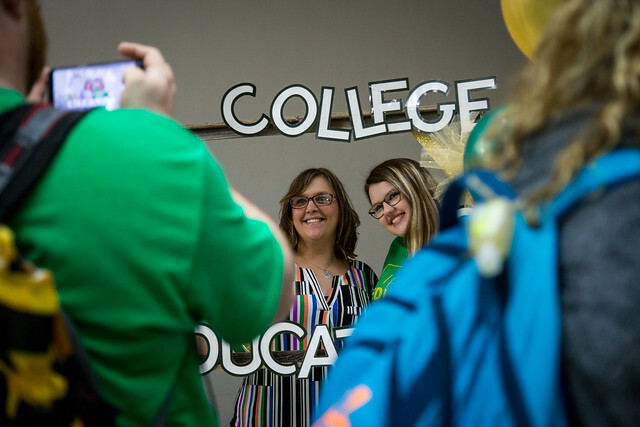 Arkansas Tech University will celebrate the completion of another academic year at Summer Sendoff 2019 from 6-11 p.m. Thursday, April 25, in the Witherspoon Hall parking lot. Free food such as lemonade, sno cones, funnel cakes, cotton candy and hand-dipped corn dogs will be served, carnival rides will be available at no charge and attendees will receive free T-shirts while supplies last. All students with a valid ATU identification card and their families are invited to attend. Students may participate in social media events April 22-25 and compete to win one of 50 “fast passes.” Fast pass winners will be allowed to move to the front of two food lines and two ride lines during Summer Sendoff 2019. In all instances, fast pass contestants must use the hashtag #summersendoff2019 and post the photo in their Instagram stories. The first 50 individuals to present screenshots of each post in Doc Bryan Student Services Center room 233 from 8 a.m.-4 p.m. on Thursday, April 25, will receive a fast pass and a Summer Sendoff 2019 T-shirt. For more information, follow @atucampuslife and @atu_sab on Instagram. Research and writing by ATU student Maggie McDonald, an intern with University Marketing and Communication (MARCOMM), made this story possible.